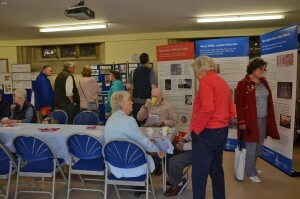 Day two of the Willis pipe organ festival on Saturday 9 September started with the Open Church and History exhibition. 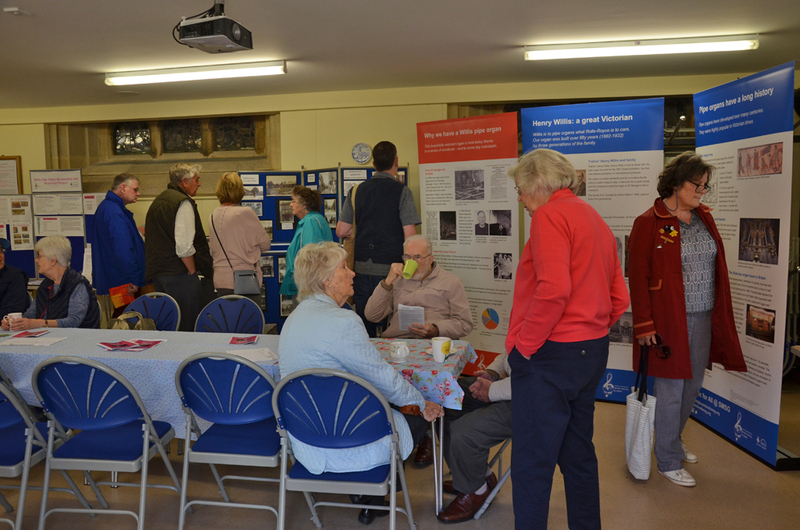 The weather was better than the previous day and there was a steady stream of people throughout the morning looking at the displays and enjoying the refreshments with plenty of conversations in the Parish Hall. 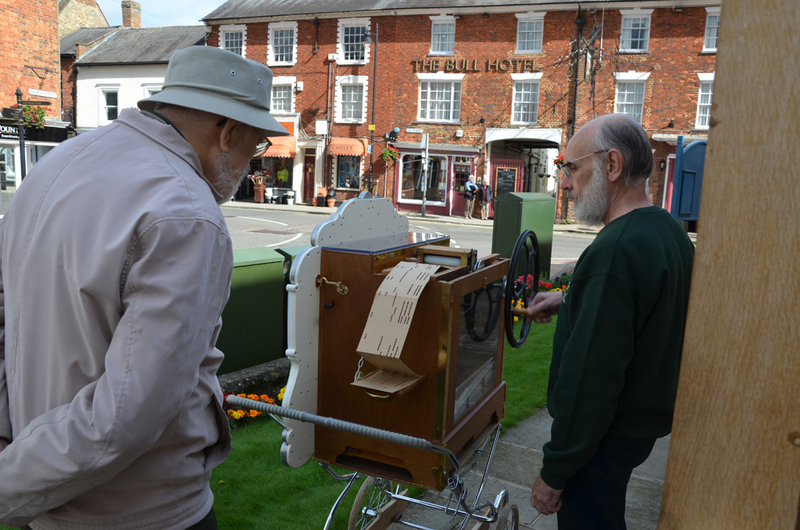 The little street organ which had appeared for the first time at the 2016 Organ Festival was playing outside the hall. 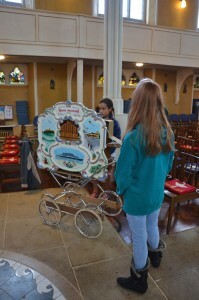 It was Ride and Stride Day for the Historic Churches Trust, however we had very few cyclists visit the church during the day (other local churches reported the same). During the afternoon Dave King and Jonathan Kingston introduced a small group of children, their teddies and their parents/grandparents to the pipe organ for the Teddy Bears' Picnic. 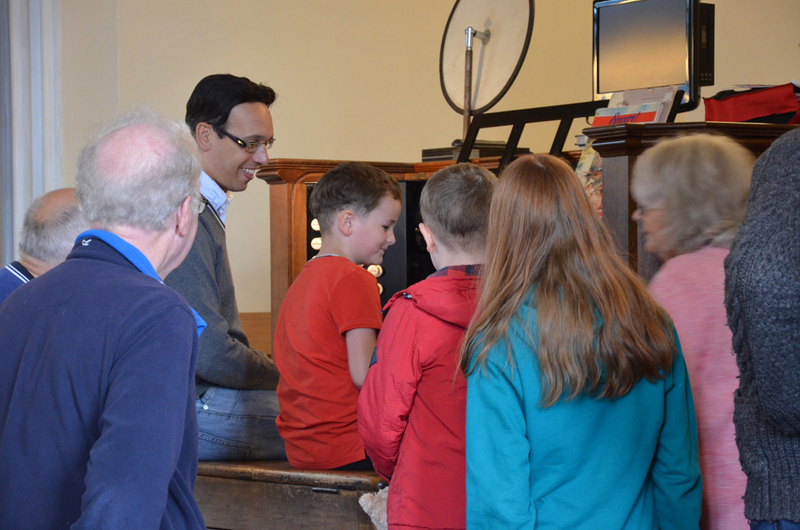 It was lovely to see the children become thoroughly engrossed in how the pipe organ works, how sounds are produced in the different types of pipes (they were able to try out blowing the small pipes the organ builders have provided which we use for school visits) with one child getting excited by the scientific principles of pipe sound production. 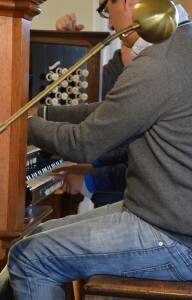 The children were also able to get their hands on the keyboards and pedal board and see inside the organ through the golden front pipes and the blower room. 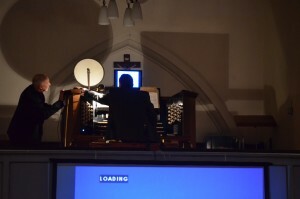 Jonathan also played some organ music for them to hear the range of sound it can produce. 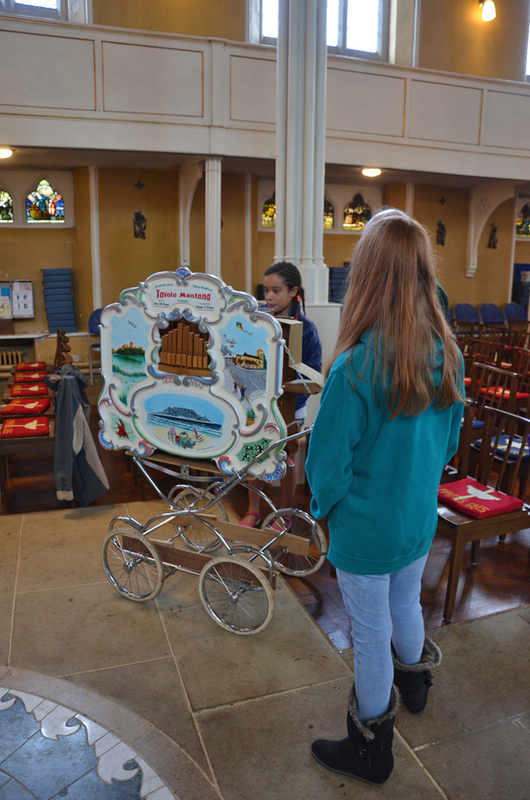 All the children had the chance to hand-turn the little street organ, with Sailor's Hornpipe featuring once again (as it had the day before), before they went into the Parish hall for a delicious picnic tea served by the volunteers. 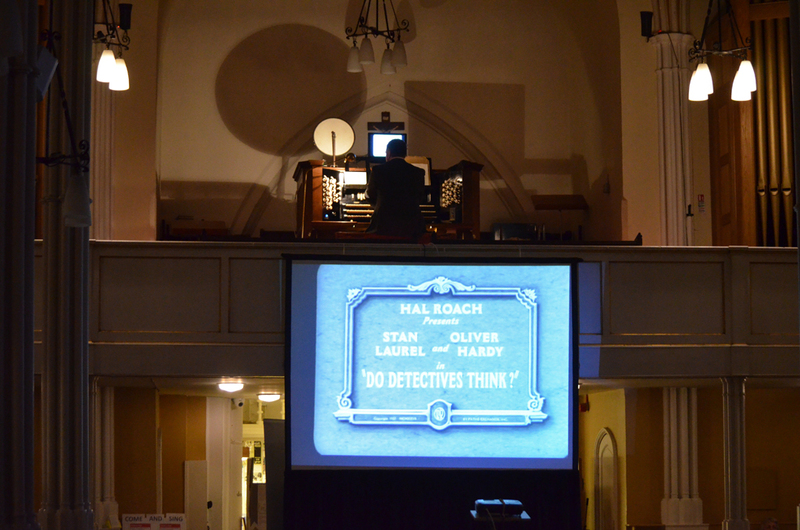 The evening team of volunteers came to prepare the church for the next event as we welcomed the return of Donald MacKenzie for the Silent Movie with live organ accompaniment. Icecream, popcorn, wine and juice serving stations were set up around the church, the technical equipment was connected and tested (we had tested it in a trial run a couple of weeks earlier) and the crowds began to arrive. Jonathan Kingston welcomed Donald and introduced him to the microphone in the glove (to save switching it off between pieces, it is placed in a glove when it is put down) and Donald wove this simple action seamlessly into the evening's entertainment as the glove took on a character all of its own! 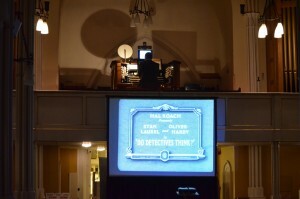 Donald started the night at the movies with some light popular pieces on the organ (town hall/seaside entertainment music) which got everyone into the mood for the movies, then the first movie, a short film 'Do Detectives Think?' 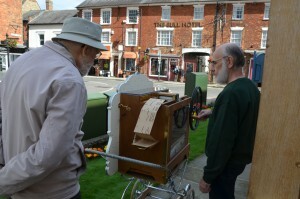 starring Laurel and Hardy was screened with Donald providing an expert, lively and atmospheric accompaniment. The interval and more refreshments followed (which also gave Donald a break) as everyone eagerly awaited the main feature. 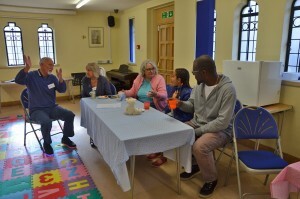 The icecream proved extremely popular. Soon everyone was in their seats again as Donald (and the glove) introduced Sherlock Junior (1924), one of silen movie star Buster Keaton's films. The story within a story provided an intriguing depth to the film and Donald's expert accompaniment on the Willis organ was unique and brought out so many elements of the story, including a snippet of Sailor's Hornpipe at one point! 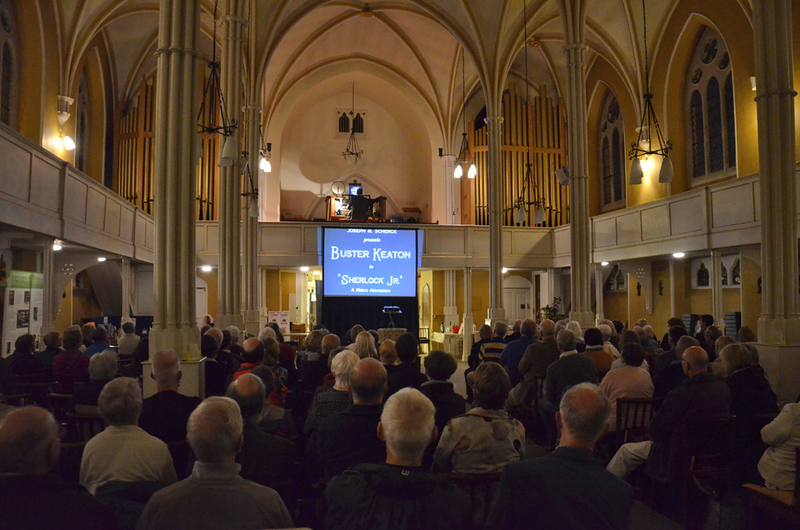 The audience was fulsome in its praise when the movie finished with many people chatting enthusiastically about the fun evening they'd enjoyed. 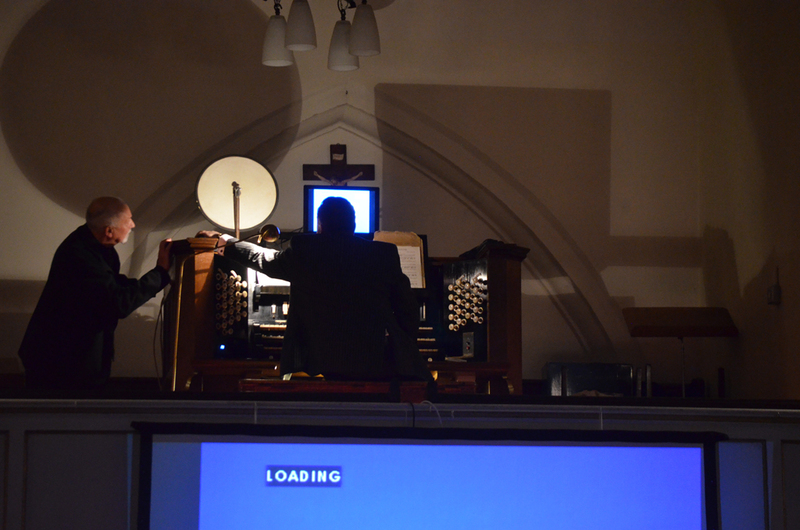 Soon the chair turning team was busy preparing the church for the morning as the screen was dismantled and the church was tidied up in record time. 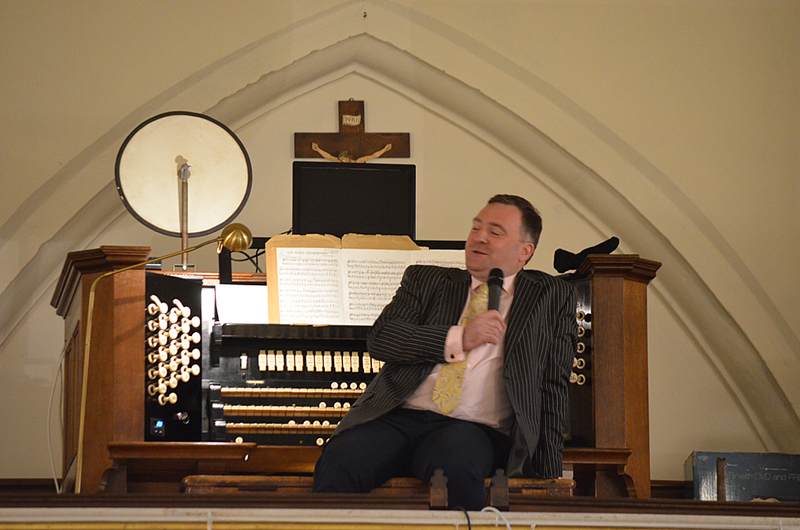 It had been a super second day of the festival, with the organists and organ providing so much enjoyment for many people of all ages. 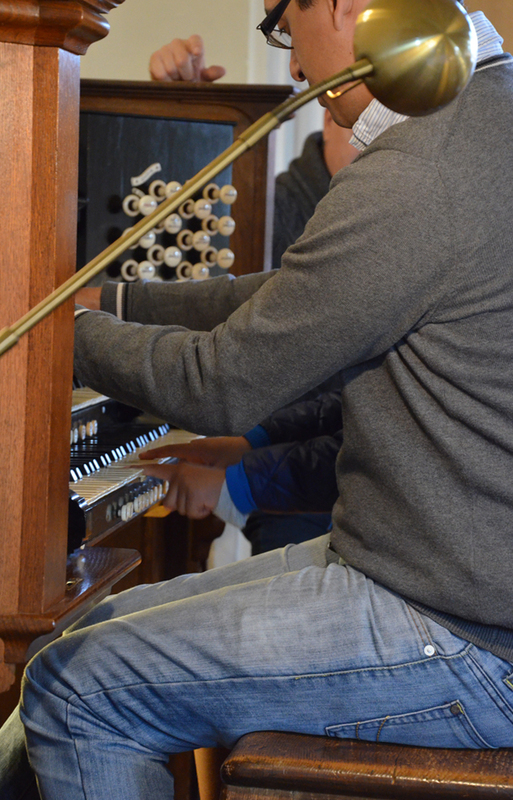 More photos can be seen in the album Willis Pipe Organ Festival 2017.